Nothing gets your blood pumping like…milk? Dairy Farmers of America, a national milk marketing cooperative, is hoping to change the reputation of a drink that’s better known for being served warm to help people go to sleep than as an energy boost. 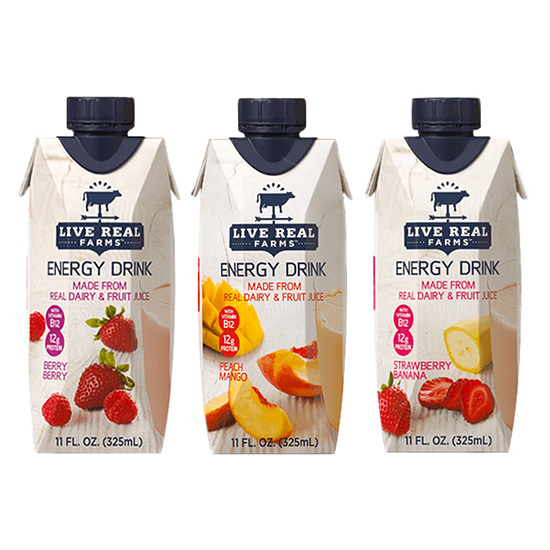 They’ve just helped launch a new product called Live Real Farms Energy Drink. Yup, it’s an energy drink and it’s made from milk. Granted, this energy drink isn’t exactly like the milk you pour in your cereal. The beverage also doesn’t contain any caffeine (not to say that “caffeinated milk” would be the weirdest product on the market). Instead, Live Real Farms uses lactose-free skim milk, fruit juice, whey protein isolate, a vitamin boost of B12 and green tea extract. The final product, which is available in three flavors—Berry Berry, Peach Mango and Strawberry Banana—comes in 11-ounce cartons that boast 12 grams of protein and 180 calories. “DFA is excited to launch a new alternative to other energy drinks, as Live Real Farms Energy Drink is made from quality ingredients that people know and trust,” Live Real Farms’ vice president of marketing and sales Jeff Hunt said. Whether people will know and trust milk and the rest of the ingredients to help them get through a ten-mile run, though, remains to be seen. What if Your Shirt Told You When You Needed a Water Break?